In our ongoing coverage of the rotten Dubai Ports World deal to run American ports, we asked this question, yesterday: Does Dubai ban Israelis and Jews from this week’s Dubai Open? “Nationals of ‘Israel’ may not enter the U.A.E.” If I’m, say, Shahar Peer, the top-40 Israeli player, I’m sure not happy that my tour is sanctioning events in countries in which I am not welcome. . . . Would the WTA or ATP ever even think about sanctioning an event in a country or club that excluded African-Americans? Shame on the Association of Tennis Professionals (ATP) and the Women’s Tennis Association (WTA) for sanctioning this bigoted event. Sickening. And shame on Andre Agassi, Martina Hingis, and the others playing in this Judeinrein event. Disgusting. It’s a good thing they didn’t know that Pete Sampras’ father is a Jew. Does UAE ban Jews or citizens of Israel? Pre-1990, Israel was not recognized by a lot of 3rd world nations. For example, I know Indians were not allowed to travel to Israel/South Africa or Israelis/South Africans to India before 1990. I personally would be surprised if UAE banned American Jews as American then would in turn ban UAE citizens from travelling to America. 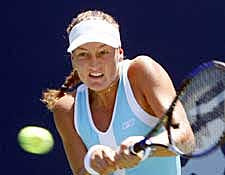 American Lindsay Davenport who is ranked no.3 in the world also played at Dubai Open. A bunch of other top tennis players are also playing at Qatar Open. Qatar probably does not recognize Israel either. There really is no justification for the Arab nations to still not recognize Israel. They all recognize Russia which has killed far more Muslims in Chechnya than anyone has except for Milosevich. locked out of a title fight against Jimmy Braddock and replaced by Joe Louis-because of Nazi policies;the tennis establishment needs a permanent vacation in Dubai. If it was a South African sponsored tournament during the White Apartheid times, there would be outrage! The ATP should be boycotted, pillaried, and harassed. Where are the Hollywood types who should be complaining publicly (Spielberg, Dreyfuss, et al.) about this? Where are the professional Race Hustlers (Jackson, Sharpton, et al.) who should be publicly complaining about this? Where’s Abe Foxman (of ADL)? Oh, that’s right, the Hollywood types are celebrating BrokeDick Mountain, the Race hustlers are practicing their Dhimmi-hood, and Uncle Abe is complaining about Religous Jews. What’s all the whining about Israelis being not allowed in UAE and all other Arab countries that don’t have diplomatic relationship with Israel? They are at war remember? Arabs from UAE can’t go to Israel either. Israeli Arabs (not just Jews) can’t go to UAE either. There is no restriction on a Jew who is not an Israeli citizen to enter UAE. WRONG! ISRAELI ARABS ARE ROUTINELY ALLOWED INTO ARAB COUNTRIES ON ISRAELI PASSPORTS, SUCH AS HANY ABU-ASSAD, DIRECTOR OF “PARADISE NOW,” WHO HOLDS AN ISRAELI PASSPORT. ISRAELI ARAB MUSLIMS ARE ROUTINELY ALLOWED INTO SAUDI ARABIA FOR THE HAJJ. ETC., ETC., ETC., AD NAUSEAM. THIS IS AIMED AT ONE GROUP: J-E-W-S. WITH A NAME LIKE AMIR, IT’S QUITE APPARENT WHY YOU REFUSE TO FACE FACTS.